Southworth Sailor: Texas Adventure - Day One - 1000 miles! We left Southworth at about 7am after dropping the boys off at church for their trip to Mexico. We made a quick pit stop in Tacoma and the next time the vehicle stopped was La Grande, Oregon. We had lunch at a local diner 'the Smokehouse Cafe' while our tires were rotated and balanced next door at a Les Schwabs. 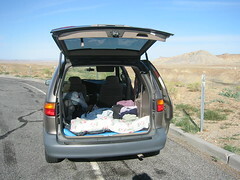 (There was an annoying vibration at 70mph) The wheel balance did the trick and we were on the road again within an hour. We zoomed through Idaho with one gas stop at Jerome and it got dark as we entered Utah. I drove until 1am, which put us in Price, Utah. We found a Walmart and made ourselves comfotable! I checked the odometer: 1000 miles! Wow thats alot of miles must of been fun!! !